Discussion in 'Gran Turismo Sport' started by GTPNewsWire, Sep 28, 2017. This article was published by Adam Ismail (@glassjaw) on September 28th, 2017 in the Gaming category. Wayne Gratiot, GBO Possum, FPV MIC and 14 others like this. Shame they probably won't be leaving this kit there! MeanElf, Lord Kacperov, torque99 and 3 others like this. It's a well known fact that video games can be good for people. Lord Kacperov and torque99 like this. JKgo, LivingWithGames, Lord Kacperov and 3 others like this. thats way i LOVE GT & just like the others GT is more than a game! MeanElf, TheNuvolari, Lord Kacperov and 4 others like this. MeanElf, Chikane, LivingWithGames and 5 others like this. It's sad that it takes initiative from a video game company to introduce activity to centres for the elderly. JKgo, MeanElf, White Mamba and 10 others like this. Turned 70 in June this year, still racing. Currently 2nd in OZ and 64th in the world in the Seasonal Time Trial 600PP GT500 Super Lap: Mazda Raceway Laguna Seca. Wayne Gratiot, Kalder, Rich S and 22 others like this. My Dad is 88 now and his mind is sharp as a tack. He took up video gaming about 5 years ago, never having touched a pc in his life. His genre of choice is flying sims and he's fully capable of programming a flight management computer or GPS system and is familiar with most of the systems on real planes. He has hundreds of pages of technical manuals for various planes and systems he's looked up himself and printed out. Gaming can really help keep a senior's mind active and engaged and I can vouch for it first hand. Wayne Gratiot, VetteZR1, beck_is_back and 16 others like this. The Geezers are keeping our minds sharp with GT6 three times a week while waiting for GT Sport. Geezlings (under 60) are invited to join us for a friendly race to see if they can outrun our walkers (new tennis balls installed). This is a great idea and hope it spreads. Dalone, Wayne Gratiot, GBO Possum and 16 others like this. I'm impressed with y'all old geezers being this good even up to date with GT6, makes me rather envious really. But yes, the fact GTSport, aswell certain other games improving your mind sharpness in the game, aswell possibly with your life, shows a good part of gaming, is half of us. If wasn't for it, we wouldn't probably be as good as we think we are. Dalone, Wayne Gratiot and geezer1791 like this. The Geezers Mascot is happy too oblige! True indeed, sad to say and as a result the UK gets social upheaval and UKIP. I like the shot of the folks all keen to see what's going on at the centre - definitely more inclusive, more funded and respectful. This happened to me to, they may be old, but believed me not all of them are slow. 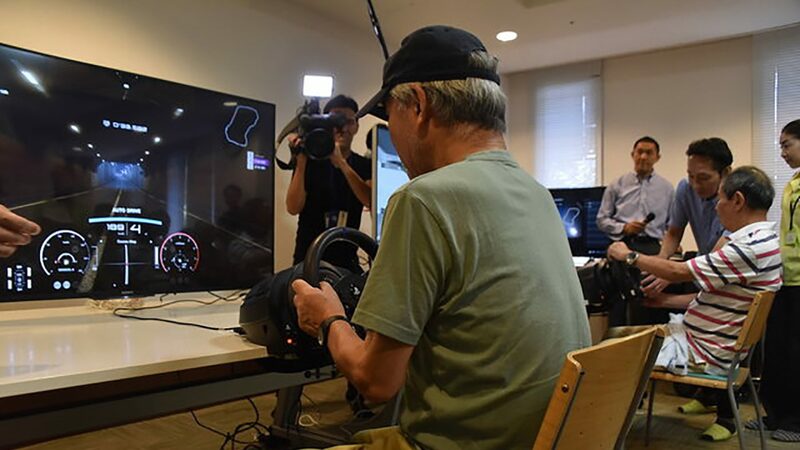 Age doesn't have to be a barrier in virtual or real life racing. There's still some very good older racers doing the rounds. Take David Franklin for instance. Never ceases to amaze me how quick he flings priceless Ferrari's along the Goodwood run. And here he is at Monza driving a Ferrari 312P how it was meant to be driven. Wayne Gratiot and ProjectF like this.